I'd call that a successful meal. I’d never cooked a pork tenderloin before last night, mostly because on the few occasions I’ve eaten it I’ve found the meat to be dry, and sometimes a bit dull. My original plan was to make pan-seared duck breast, a fine main course for a Valentine’s Day dinner, but my plans were thwarted by lack of availability (in Brooklyn! I went to 4 supermarkets Monday and couldn’t locate fresh duck at any of them). Meet pomegranate molasses: the home cook’s secret weapon for turning an otherwise dull meat into something extraordinary. 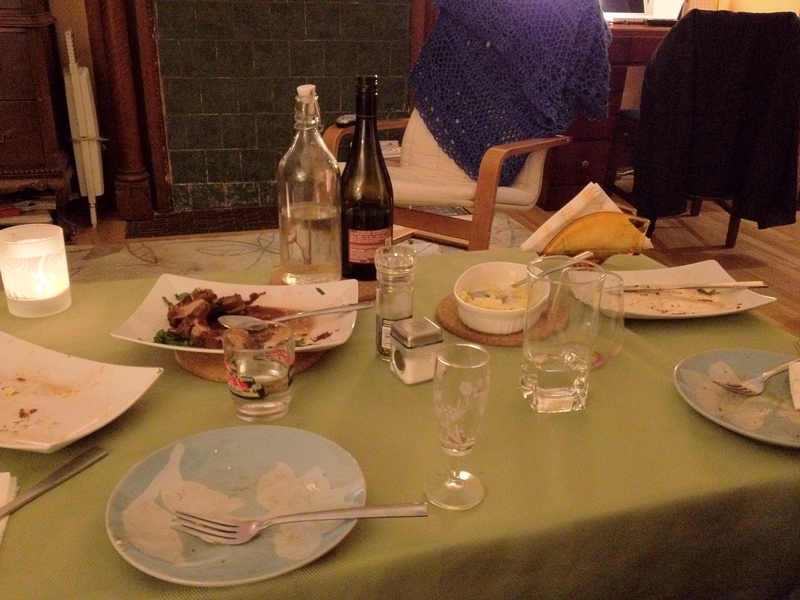 (I should point out that duck, an extraordinary meat on its own, is just sublime with this stuff.) 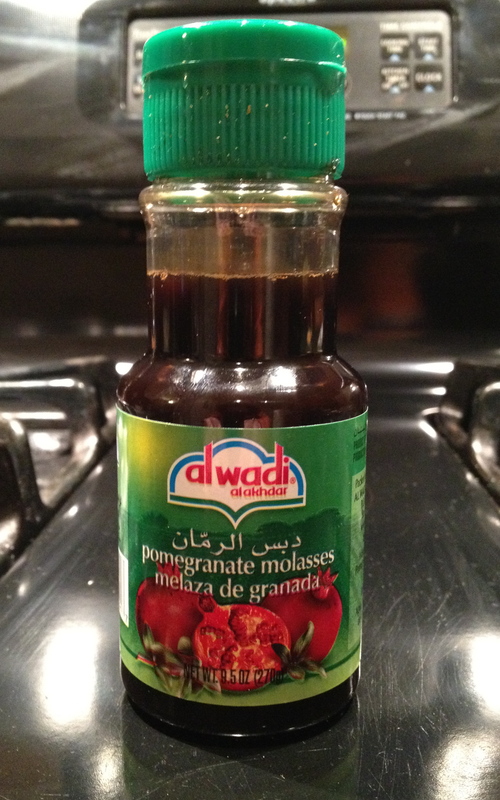 Pomegranate molasses can be found at Middle Eastern grocery and specialty stores (like this one), and a little goes a long way—this is super-concentrated sweet-tart to the max, deep in color, and viscous like honey. It’s also really economical—this bottle set me back 3 bucks, and you need very little to make the sauce. When it came time to preparing the pork, I used tips from a couple of different recipes to achieve maximum flavor and tenderness. My recipe starts with a spice rub, then pan-searing the meat in a cast iron skillet before finishing it in the oven. While the meat cooks in the hot box, you make the sauce on the stove. Even allowing the meat plenty of time to rest, the whole process takes no more than a half hour. The result: moist and tender meat flavored with a sauce that gives a jolt to your taste buds—not in a jolt-from-crazy-hot-sauce kind of way, but more like a “Holy crap, this is unlike anything I’ve ever had!” kind of way. That’s what a dose of sweet-tart-central on pork will do to you. My boyfriend and I had the same “Yow!” reaction, and then we didn’t really speak to each other because we were too busy eating. Combine ingredients for spice rub in a shallow bowl and then dredge the tenderloin in the rub, coating on all sides. Pre-heat oven to 500 degrees. Heat a large (10″ – 12″) cast iron skillet over high heat and coat with non-stick spray. When the pan is hot, use tongs to place the tenderloin in the pan. Cook for about 1 minute on each side—the goal is to brown all sides. Carefully transfer the pan to the oven and bake for 10 to 12 minutes. The meat is done when a thermometer poked in the middle reads 155 degrees. While the meat is in the oven, grab a small saucepan or 9″ skillet and set it over medium high heat. Add butter. Once the butter is melted, add the shallots, adjusting the heat so the butter doesn’t burn. Sauté the shallots for about two minutes, and then add the remaining ingredients. Increase the heat so the mixture reaches a boil, and then reduce to simmer for about 10 minutes. The mixture will thicken slightly as it reduces. When the meat is ready, transfer it to a cutting board or plate and cover with foil. Allow it to rest for about 5-7 minutes before slicing on the bias. Arrange on a serving plate (chopped parsley makes a nice garnish here), and pour sauce on top. Ta-daa. I served this with parsnip apple smash—sweet and just a tad spicy, with a more complex flavor than mashed potatoes and the added bonus of having apple, one of pork’s best friends. This is probably the most economical special occasion meal I’ve prepared. Pork tenderloin is widely available and generally inexpensive (I got 2 pounds for just under $10), and as I mentioned the bottle of pomegranate molasses was only $3. The most expensive item involved here is the wine (I was fortunate to have a bottle left over from the Super Bowl). Still, if you’re planning to drink wine with the meal, get a decent bottle of Pinot Noir and you’re set for the sauce. Cabernet would work too. This is also a meal you don’t have to feel guilty about—pork tenderloin is a lean meat with barely any fat on it, and the only fat you’re adding here is the butter. Olive oil makes a fine substitution. 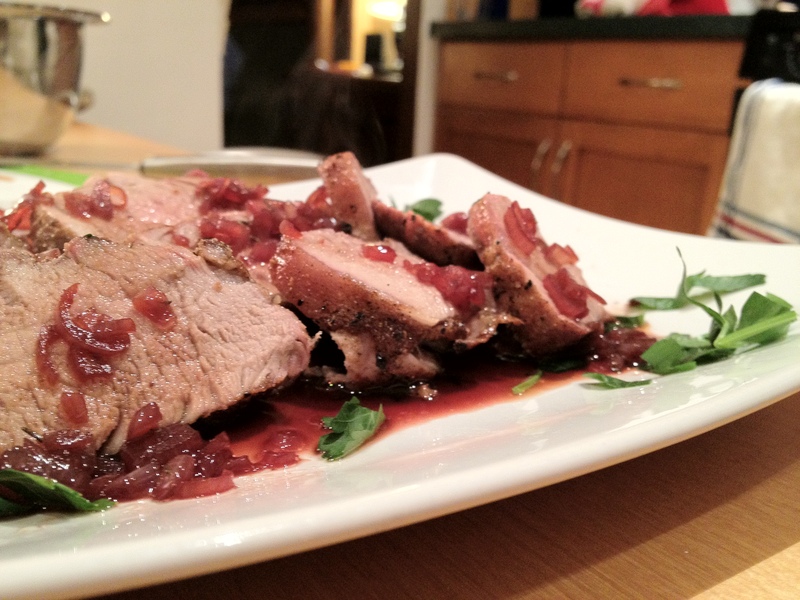 This entry was posted in Recipes, Savory and tagged abby hitchcock, camaje, cheap, cooking class, dinner for two, easy, economical, inexpensive, meat, photo, pinot noir, pomegranate molasses, pork, pork tenderloin, quick, recipe, romantic, Valentines Day. Bookmark the permalink.